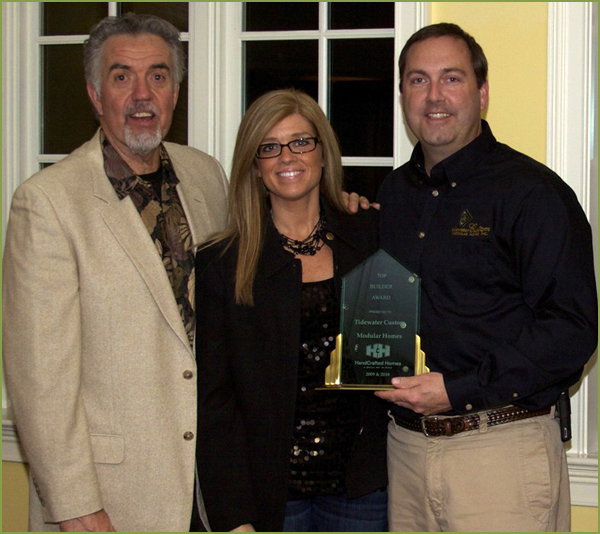 Henderson, NC – March 8, 2011: Excel – Modukraf Homes (www.handcraftedhomes.com), a leader in the modular home industry, recently held their annual Builder Awards Roundtable event at their Henderson, NC facility, followed by an awards dinner at Henderson Country Club. Seven of Excel – Modukraf Homes’ builders were presented with a plaque in recognition of their outstanding leadership in sales, as well as innovative design of the HandCrafted product and customer service for 2010. Attendees and award recipients included Tammy and John Glover of Tidewater Custom Modular Homes; Jon Duncan of Mayland Home Builders; Tony Hirst of Tony Hirst LLC; Len Fairfield of HandCrafted Builders LLC; Larry Sauls of LGS Homes; Rob Crisman and Bobby Crisman of Lake Gaston Homes, and Kelvin Covington of I&J Home Builders. Named as a Top Modular Home Builder by Builder Magazine, Excel – Modukraf Homes has consistently set the standard in the customized niche of the systems-built home market by providing builders with superior customer service, state-of-the-art modular technology and unique home designs. Each and every Excel – Modukraf Homes modular home leaves their facility ENERGY STAR ready. That means that when a HandCrafted Home arrives onsite, it is ready to be installed by one of their builder partners as an ENERGY STAR certified home, making them 20-30% more efficient than a conventional stick-frame home. Excel – Modukraf Homes was established in 1998 and is a wholly owned subsidiary of HHHunt, a major residential and commercial real estate developer. For over three decades, HHHunt has been a recognized leader in real estate development through out Maryland, Virginia, North Carolina, Tennessee and South Carolina. For more information about Excel – Modukraf Homes, to find a builder or learn more about Excel – Modukraf Homes’ designs, call toll-free at (877) 424-4321, or visit them online at www.HandCraftedHomes.com. For media inquiries, please contact Scott Rouleau at Rouleau Communications LLC by calling 860-677-0560 or via email at scott@rouleaucomm.com.